Style Notes | Oh you fancy, huh? 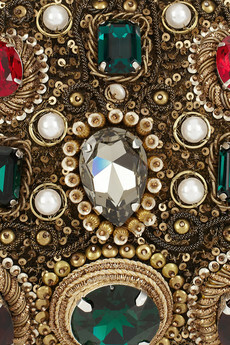 Check out this dynamite show-stopping piece by Dolce & Gabbana. Introducing: The jewel and pearl-embellished clutch via Net-A-Porter. My gosh, the craftsmanship is to-die ... I am literally in awe. But do you want to know how much? [giggles] $6,895. And that's why it's just—an obsession! what a gorgeous piece of luxury! 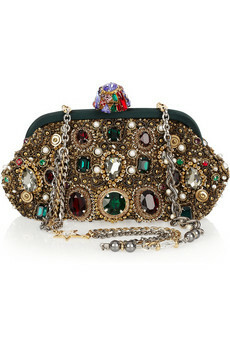 Wow, this glittering little clutch is Amazing!!! One of my favorite bags ever is a brown leather D&G, and I've worn it into the ground! 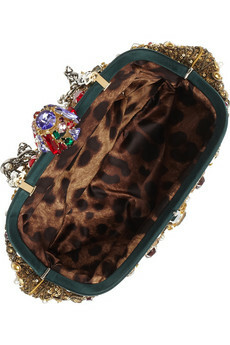 Love this bag, and the lining is totally fun and unexpected.